The Cincinnati Reds (8-7) begin a four game series at Great American Ball Park tonight against the first place Chicago Cubs (11-4). 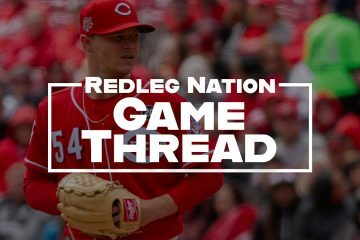 The Reds are coming off a series win against the Colorado Rockies. 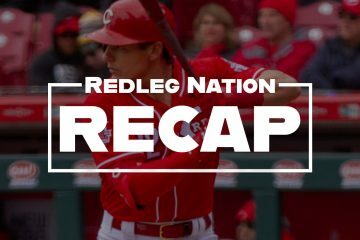 The Reds did however get swept last week by the Cubs at Wrigley Field. The Cubs come into town with the best run differential in baseball at +44 (next best is the Cardinals at +31). The Reds have a winning record despite their -16 run differential. It will be a tough series for Reds hitters, as they will face the top of the Cubs rotation in order: Jake Arrieta, Jon Lester, John Lackey, and Jason Hammel. Brandon Finnegan is off to a great start in the Reds rotation, but he will have his work cut out for him tonight. He’ll be facing last year’s NL Cy Young award winner Jake Arrieta. Finnegan took a no-hitter into the 7th inning against the Cubs last week. While it is obviously very good to no-hit a team for 6.2 innings, Finnegan did walk 5 batters in that game, and was benefited by the wind drastically blowing in. There were several hard hit balls that would have likely ended up in the seats if the wind was blowing out. If you only look at Finnegan’s peripheralÃ‚Â numbers, he has been just about what was expected of him. He was projected to put up high strikeouts numbers, high walks numbers, and give up an average amount of home runs. There is a lot to like about Finnegan. His stuff has looked dominant at times, but he has got to drastically cut down on the walks if he wants to have success at the MLB level. Jake Arrieta has picked up right where he left off from his Cy Young winning season last year. As you see below, he has absolutely dominated in 2 of his 3 starts in 2016. The only start that he didn’t dominate, he still threw a quality start and even hit a 2-run home run in the game. It has been very difficult to get a walk against Arrieta so far in 2016. He has only allowed 2 total walks in 22.0 IP. The one good thing for the Reds is that Arrieta hasn’t dominated them like you might expect. Arrieta has a 3.58 ERA in 5 starts against the Reds (all coming between 2014-2015). He has struck out Reds hitters 41 times in 32.2 IP, while only allowing 9 walks. The Reds haven’t seen Arritea since April of 2015 though. Arrieta didn’t start his incredible run of dominance until the second half of last season. 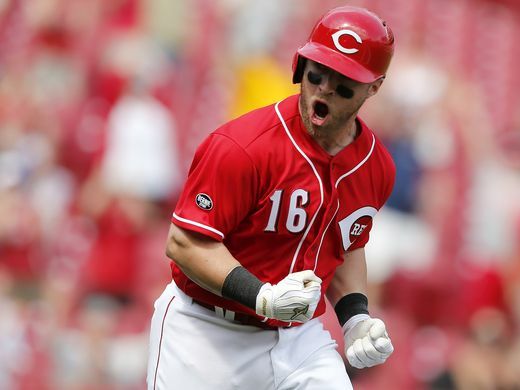 Zack Cozart (4 for 12) and Brandon Phillips (4 for 11) have had the most success off Arrieta. Billy Hamilton has actually drawn 3 walks from Arrieta. Bruce is 2 for 11, and Votto is 2 for 8 with 1 walk. Dexter Fowler is off to an incredible start for the Cubs. He leads all MLB players with a 1.7 fWAR, and is hitting .392/.523/.706 with 3 HR and 226 wRC+. The scary thing about the Cubs is that they are 11-4, and have had slow starts from their core of hitters: Kris Bryant (87 wRC+), Ben Zobrist (72 wRC+), Jason Heyward (42 wRC+), Addison Russell (76 wRC+), Jorge Soler (75 wRC+), and Anthony Rizzo (113 wRC+). Jay Bruce hit another home run yesterday, and now has 4 long balls on the season. Bruce is hitting .293/.311/.569 with a 130 wRC+ on the season. Bruce has done a much better job spraying the ball all over the field, which helps immensely with the shift. Jake Arrieta is really good. It will certainly be a major challenge for Reds hitters tonight. It will however be fun to see the Reds young rising star Brandon Finnegan get to face off against last year’s Cy Young winner. If you dare to dream, a Reds four game sweep of the Cubs would put the Reds in first place!?!? Go Reds! Finnegan vs. Arrieta will be a nice matchup to watch tonight. Plus updates on Homer’s outing will certainly come during the broadcast. Finnegan just needs to shut out his mind who is pitching for the other team; and concentrate on getting an out at a time. Everything else is beyond his control and will go however it goes. I am not cool with having to see the Cubs again. I’m super over the imbalanced schedule and playing teams 18 times in the division. I wish the Cubbies would be seeing Iggy instead of Straily or Moscot; and, i’m hoping the Reds have already decided to spring R.Stephenson on them Sunday and are just playing out the dance to get there. I’m headed to GABP for my first game of the year in person. The Reds have won three consecutive home series in a row. Hopefully they can keep it going against the Cubs. Gonna be tough against Arrieta tonight. Rainy and overcast in the area. You need to root us home a winner, Steve. Tough start to the game. A split, at least, in this series would be a big step forward. Reds pitchers have the 2ND highest walk rate in baseball. Reds hitters are 24th in walk rate. Cubs pitchers have the lowest walk rate in baseball and Cubs hitters have the highest walk rate in baseball. Cubs are controlling the strike zone on both sides. The Reds? Not so much. every time we play the stupid cubs I lament the trade of Travis Wood. I like this rotation for now and we see who emerges as Starters for the rest of the year. Billy Hamilton has a sore thumb, hurt it on one of his wall climbing adventures. Apparently he could pinch run or play the field, but not hit. Price also thinks that Hoover can eventually be the closer again, but until he gets back on track, it’s closer by committee. Move along, nothing to see here …. Suarez not throwing to home cost the Reds a run… down 4-0 to Mr Arrrieta is pretty much ball game. Bottom of the 2’nd, 4-0 Cubs………..
Too soon to pray for rain? I wouldn’t mind taking a mulligan on this one so far. We need to get the bats going tonight! Well if you didn’t see this coming then you had blinders on…unfortunately. Finnegan has very good stuff but that high heater to righties up above the letters is only going to rode out of GABP! 2nd start at home and 3 HRs to righties in 8 innings….but hey this is the year to gain experience and find out what does/doesn’t work! Homer thru 3 for the Bats….0 runs, 2 hits, 1 bb, 5 Ks!! One more in Lville and get’em to the park! Same thing w/Lamb and Disco hopefully? Price said on the pre-game that Bailey would probably have three rehab starts, and two for the other guys. +3 For the Benny Hill music reference. Quite appropriate this evening/. Line on Bailey: 3 2/3 innings, 3 hits, 2 ER (HR), 2 BBs, 6 Ks all on 67 pitches (47 strikes). When does the no-hitter watch start? I would think it is on now (5 full in the books). I didn’t see the Votto groundout after Suarez was picked off but MartyB said is was a sure hit if Rizzo was still holding the runner on. Seems like those kind of things are often omens in no hitters. Reds just love making outs on the bases. Love it. Ya know, at some point, Suarez should quit getting picked off. The Reds have not played sharp baseball on the basepads, in the field on defense, or at bat (sometimes). It’s almost like they have no….focus. Suarez is not a good fielder. When is Tim Melville going to be sent down or waived even. Love the guy’s story, but he’s not close to being a MLB pitcher. I feel sorry for the guy. He has zero business on any MLB roster. I was just getting ready to say that. When that inning began, I was feeling bad for Reds fans. As that inning unfolded, I felt more sorry for him. Baseball is a funny game. The kind of defense Suarez is showing over at third is what I actually expected from Frazier when he first took over for us there. I can remember thinking at the time “Hey if he can hit then we’ll just have to eat some errors at third” and then he went on to be very solid. Suarez though just looks bad and even if he works at it I’m not sure he’ll approach what Todd was giving us. You can always rely on Melville to keep your team in the game. Price needs to get into these guys….if they’re going to check out in April then what happens when they’re 50-62 in the summer? 50-63 I guess? If he loses the team he’s gone anyway. Doubt there’s a whole lot Price can do. Everyone on the team knows it’s a rebuild year and while I may just be projecting it really shows on a lot of them. Lots of less than full effort from some particular guys in my view but it just makes the contrast more obvious with the guys who are still working hard. The other thing to keep in mind is the talent level. We’re used to a certain level of talent on this team after the last 5-6 years and this year it’s just not there. Anyone who doesn’t try should banished to the pine ir the minors. This is why you go with youth, they still have something to play for. Their future.. Vets like Dat dude DP needs to sit. Atleast I have Fowler on both fbb teams plus Arrieta, Bryant, and Zobrist. Finally. a Reds pitcher that keeps the ball DOWN. I saw Ross hit a homer in GABP in 2006. It was a walk-off win over the Dirty Birds. That was fun to watch with a sold out crowd. I’m glad I didn’t see his dinger tonight. I was there for that, too. Longest home run I’ve seen in person at GABP. I had caught a foul ball hit by Ross earlier in the game! That was before they had added the bar part above the batters eye and Ross’s home run cleared the black batters eye. I was thinking it was to left … all I know was it was a full house that night and I had purchased the $5 general admission. I believe it was Dave Concepcion bobble head night. Will this lopsided beat down dispirit the Reds for the rest of the series? I can’t remember the Reds getting beat THIS BAD in a game. And there are still a few innings to go. It looks like an A ball team playing Major Leaguers. And Steve Mancuso went to the game. He must be pretty disappointed. Well – this is embarrassing. I see the Reds are trying to break-up the no hitter by “giving up long rallies to the other team so the pitcher can get cold” strategy. That seems to be working as well as the “get your whole bullpen from pitchers cut from other teams” strategy. Arrieta! Guys like him are the reason you don’t just stick guys like Lorenzen in the pen after a few rough years as a starter. Not too many guys can just casually fire it 95 mph for 6-7-8 innings at a time. When you have an arm like that then the breaking stuff can be that much deadlier if it can be developed? Most of the time they end up like Homer or worse but you don’t find a guy throwing 91 that can be a horse like that! Haven’t looked it up but Arrieta was in the AL for 3 years atleast and was a bust more or less. Woo Doggy! Just checked in and I expect a somber recap tonight based on what’s happened. Maybe just show the Milton with nothing else said? Hard to remember that the Cubbies were essentially an automatic W for many years. This is some serious payback going on since last season. Well – looks like Cozart will have one more shot at extending the hitting streak. I guess the Reds are taking PrinceÃ¢â‚¬â„¢s passing really hard. When’s the last time the Red’s lost by 14? Any bets on whether they’ll match that margin of loss again this season? Whoops! Spoke too soon. How long has it been since the Reds lost by at least 16?! If anybody else is still here, may I ask why??? Come for the witty banter, stay for the masochism. This is about the worst Reds game I think I have ever watched in my life. Let’s hope so, David. We’ve got a 146 more of these to go this year. Reds with a terrible effort tonight. Well, that was a thing. I think that was the most lopsided game I have ever seen in the pros. I guess some of you don’t remember the 22-1 beatdown the Phillies put on us in 2009. Cueto started that game . Sometimes it happens. Good thing about baseball you can do something about it the next day. Tip of the old hat to the Cubbies and Arrieta. Hope this doesn’t portend things to come this year. As far as I can tell, that was the most runs scored in a no-hitter in the modern era. There was one 18-0 game in 1884. Otherwise, this is it. The season is still young, the Reds may be able to break that. I guess if you’re going to have a bad game, might as well have one for the record books. If it had been a boxing match, it’d have been stopped around the 6th. 4 pitchers need to return their game checks. It is one thing to surrender to a great pitcher and admit defeat. It is another to show no sportsmanship and attempt to do your job at the highest level. 0 excuses for giving up this number of runs. As an owner I would also call this grounds for immediate dismissal of the pitching coach and manager. Seriously??? We didn’t plunk a single Cub? This isn’t 1970. What good would hitting a Cub do? Teach them to respect a team they are clearly superior to in almost every single position? You didn’t see the Cubs beaning Reds all those years they were terrible and we were not. It is still part of the game. Used to be a time when running up the score like that was considered unprofessional. Hence the plunk. Sorry I’m old school and still see the need for aggressive game play. I guess you are a fan of no contact at catcher position as well? Look at it this way….by my unofficial count we’ve been outhomered by more than 2-1….outscored a mile. The bullpen is prob dead last now and Votto is vacationing w/Mendoza and somehow we’re 8-8? What is our run differential this year? -27 I think after that game? Well, it was only one game. Steve Mancuso actually got to see a very history game. Just not one that will figure large in Reds’ history. Breaking news….the artist formerly known as Joey Votto will know be known as ?$?